Rent Batanga | Corporate Events | Wedding Locations, Event Spaces and Party Venues. We transformed an 1880‘s saloon into a modern tapas restaurant with a vibrant, fun atmosphere reminiscent of Latin America. With over 9,000 square feet of space, we're the perfect place for your next holiday party, corporate, or social event! Featuring Latin American tapas dishes (small plates) that originate from places such as Peru, Brazil, Spain, Colombia, Mexico, Cuba, Argentina, and Portugal, we’re open 7 days per week for lunch and dinner, with a Happy Hour that runs 3pm – 7pm M-F.
We feature exotic, handcrafted cocktails and extensive wine list. On Sundays, bottles of wine are 50% off and brunch is served 11am – 3pm, followed by our popular 3-course Sunday Supper after 4pm, which consists of a farm salad + whole roasted suckling pig + local vegetable + Chef’s dessert. 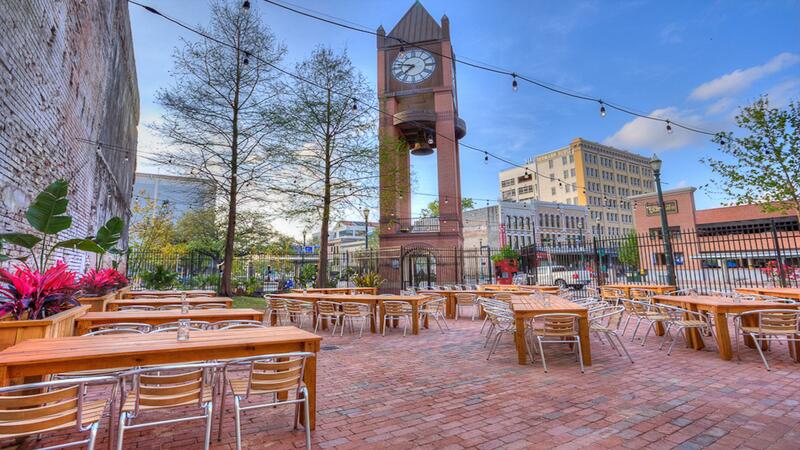 At 3,600 square feet, our bricked patio is the largest patio in Downtown Houston. It’s the perfect place for an evening out with friends under the patio string lights, for happy hour with your co-workers and colleagues, or for relaxing on Sunday with half off all bottles of wine all day long (excluding bubbles), having a leisurely brunch with friends, or partaking in our three-course Sunday Supper consisting of whole roasted suckling pig, local farm salad and vegetable, and Chef’s dessert.